After a stellar business career spanning more than six decades and wide acclaim, Henry Tippie continues to hold eastern Iowa high in his mind and heart. That was made most evident again on May 30, as Kirkwood Community College announced a $1 million gift from the Belle Plaine native and his wife Patricia. The donation will establish an endowed scholarship fund, providing financial support to Kirkwood students in business programs in perpetuity. College officials made the announcement at the end of a celebration of the Kirkwood Foundation's Real World Success capital campaign. The final total of $18,701,497 far exceeded campaign organizers' original goal of $12.5 million, achieving nearly 50 percent over the goal. In honor of this gift, the college has named a key meeting facility The Henry B. Tippie Business Event Room. It is a focal point for many corporate and organizational functions since the Kirkwood Center opened in early 2008. In remarks to hundreds of supporters and staff, Kirkwood President Mick Starcevich called Tippie a ?model Iowan? who has kept a close and caring watch on his native area. "Henry has never forgotten his Iowa roots. He has never forgotten that personal success must include the stewardship of the world around you. He is a shining example of the wisdom that improving the lot of those around you now will make the future richer for everyone later on," Starcevich said. Henry B. Tippie grew up on a farm near Belle Plaine, Iowa and formed his work ethic during the 1930s Great Depression. He enlisted in the Army Air Force after graduation in 1944, and served both domestic and overseas in the Pacific with the 20th Air Force in the final days of World War II. He later went on to study business at the University of Iowa, earning a BSC degree with a major in accounting. He quickly rose in the ranks of American business, eventually helping to found and guide various business operations from home pest control to cattle ranching and NASCAR racing venues. He is the director of five companies traded on the New York Stock Exchange that he helped to create. His support of higher education in Iowa is legendary, including a major gift to the University of Iowa that created the Henry B. Tippie College of Business. Another recent gift established an endowed business faculty position at Coe College in Cedar Rapids. 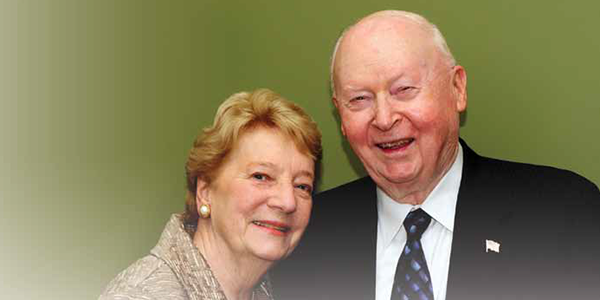 Tippie and his wife, Patricia, have long been stalwart supporters of Kirkwood, creating gifts of beef teaching facilities at the college, as well as establishing the Tippie-Mansfield Center and an additional teaching annex in Belle Plaine. The couple has funded several scholarships over the past two decades, and has established one of the first endowments of Kirkwood?s Endowed Faculty Chair program. Other Tippie gifts have encouraged construction of the Belle Plaine Community Library, the Belle Plaine Area Museum, and the Mansfield/Tippie Airport and Industrial Park. His many business achievements and leading philanthropic generosity have earned Henry B. Tippie many awards and honors. He was given the nationally prestigious Horatio Alger Award in 1996, and was named to the Junior Achievement Eastern Iowa Hall of Fame in 2004. Tippie is the recipient of an Honorary Doctorate from the University of Iowa in 2009 and from Allegheny College in 2011. Kathy L. Hall, Kirkwood's Vice President of Development, said "Due to the extraordinary generosity of Henry B. and Patricia B. Tippie, countless generations of Kirkwood students will benefit from increased opportunities and access to education."